We’ve got to give Kerry Washington, "Scandal" costume designer Lyn Paolo and The Limited’s head of design Elliot Staples some props: By the time they arrived at the IAC building Monday evening to fête the launch of the "Scandal" line they’d created for The Limited, they&apos;d already been out promoting it all day, starting with an extra early appearance on Good Morning America. Still, they were all smiles and enthusiasm. There was (and is) plenty to be enthusiastic about. The capsule collection, which has just hit stores, offers the average shopper at The Limited some chicer options for the office. 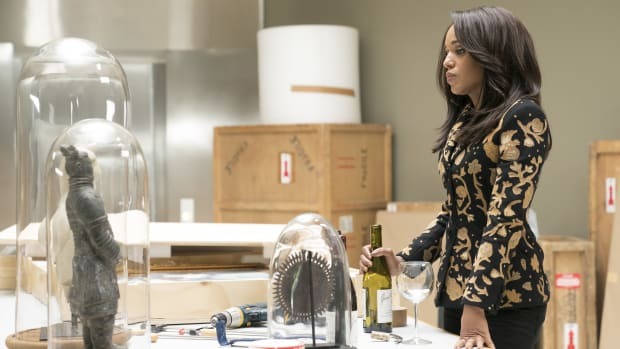 For die-hard fans of the show, it’s a step closer to living the dream -- that is, physically morphing into Olivia Pope, the character played by Washington on the hit ABC series. The range got the fictional fixer’s personal style down to a T. From the long leather gloves to the plaid cape (the designers&apos; favorite piece), the collection really captures Pope&apos;s style. But the line deviates from Pope&apos;s signatures in some respects. The character, for example, rarely wears dresses, but Paolo and Washington really wanted to think of the fans in this one. “We struggled with it, we thought, ‘Should it be all pants?’ Kerry and I decided that a lot of our Gladiators [ed note: &apos;Scandal&apos; fans] were skirt girls, so we decided to throw some dresses in there," Paolo said. Washington, Paolo and Staples worked together to conceive the line, though it was Kerry’s first time designing – and it’s clear that she’s taken quite an interest in it. “I learned that the part of my brain that’s really concerned with detail and super Type A – that’s a good thing when it comes to designing clothes,” she said. This won’t be the last we see of Washington in the designer’s seat. The Limited is putting out "Scandal" collections for Holiday and Spring, so there will be plenty more opportunities for her to exercise that muscle. But for now, we’ve got this. The collection seems poised to sell, and if you’re smart, you’ll get your hands on that cape – it’s a favorite of the design team, and we bet it’ll do well in stores. But if you miss your chance to get it now, don’t worry: Kerry let it slip that they’ll be doing another version of the cape for spring. 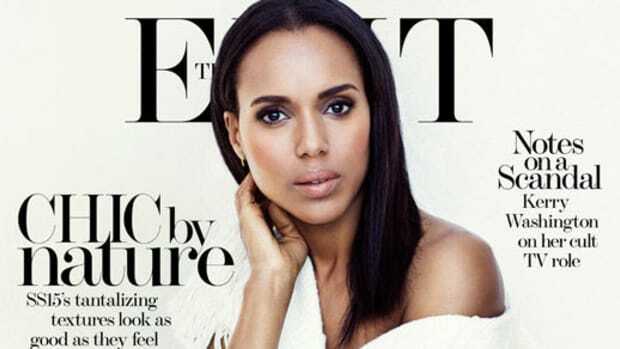 Kerry Washington had a hand in designing, of course. And Kim Kardashian is back to brunette.